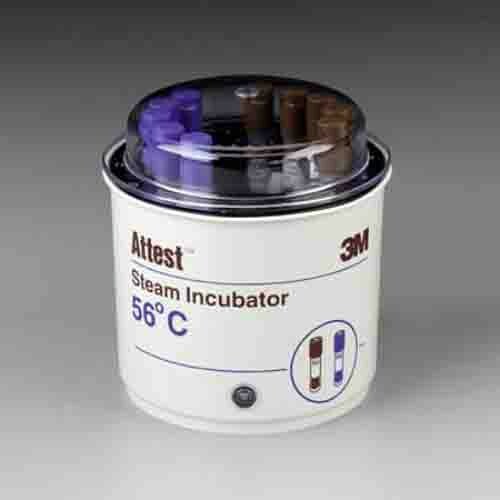 The 3M Attest Biological Monitoring System for Steam Sterilization is a system that provides convenient steam sterilization cycle monitoring. This self-contained biological indicator has the ability to reduce the possibility of sample contamination. The 3M 116K Attest Incubator minimizes false positives and ensures more accurate results. It automatically crushes vials to release medium, which allows it to be easier and safer than other standard systems. The 3M Incubator has a 14-vial capacity, which makes it ideal for large and small offices. It features a translucent cover for easy observation of color indicator change. It has a dry-block design that is set to the proper incubation temperature to provide consistent and accurate results. This system is color-coded (blue & brown) for simple use and quick reference. This device has a readout that is available in 24-48 hours for fast results.